I've been working on class samples for, believe it or not, 2014. Teaching has been such a blessing for me and there are lots of fun things about it, not the least is having the opportunity to visit and explore new places. But I can easily say that my very favorite thing is my students. Online and in-person...I love you guys! You always amaze me with your creativity and enthusiasm and I love being with like-minded artsy types. One of the hardest things about teaching is having to plan for classes a year in advance. Part of my trouble with this is that I just get going on something exciting and new, then have to put it down to work on the next thing. Of course, it's difficult to get back to it, after that but, hey, that's life. Things keep rolling. So, my class-sample-obsession, of late, is these formed metal Pearl Pod Pendants. I finished up my lovely little Santos doll necklace and moved right into the pod preoccupation. They're kinda addicting to make! I'm thinking these two classes, plus one more, will be offered at Art Retreat in the Desert, in Tuscon (during the gem show) in 2014. The updated info isn't up on the Desert site, yet...soon, I think. I've got a couple of new tutorials in the works, as well. This one is finished and available, here. My Double Loop Link is super versatile for making connections and chain. Yay! Oh yeah...registration for my newest online class Bezel Bootcamp is ongoing. This is shaping up to be such a great class. The students have hit the ground running and are making amazing things. I love that. So...what else...? It's been about 100 degrees here, with about a bazillion percent humidity...but we had a nice cool spring and my daylilies were fabulous. Don't you just love color? There are some terrific color palettes here. Number One son counseled me on how to take a decent moon shot. This is another variation of the super moon shot I took, last weekend. It's a fascinating surface. Makes you want to howl...yes? Um...yes...these arrived on my doorstep. I know, I know...I do have some other boots but just look at that sugar skull. These were so unique and, well...out there. They're just so "me." We babysat our neighbors sweet girl, who is still a puppy...only about 5 months old...and bigger than Miss Mayzie. Of course, that didn't phase M, in the least. Look at the teeth on that girl. And, look at the big ears on that other girl. You can imagine the outcome. hahaha! If you've "friended" me on facebook, you've probably seen some of these photos. Did ya'll know that I have TWO facebook pages? My personal one, here...and my business page, here. Last thing...I've been working on a super huge project that I can't really say much about yet. But, I think you're gonna love it. I HOPE you're gonna love it! I wonder about you all...are you working through the summer like I am, so far? Are you vacationing? Enjoying having your kids at home? Is there rain, in your life...or sun? Sunny days...I hope! In case you missed it...Super Moon, June 2013. I'm pretty sure this could have been a lot better if I'd not been too lazy to fetch my tripod. Not bad for a hand held shot, from the backyard, with an older lens, sans image stabilization. Thank you, Number One for your photog advice. My dream of summer camp is about to become a reality. Bezel Bootcamp...my new online jewelry making class...begins, this Friday! I'm so excited but I have a ton of work to do before the classroom opens. I'm dashing about, straightening desks and clapping erasers together...clearing counter space and fixin' to answer and and all questions that come my way. This new bezel class is taking the place of my retired Of Towers and Turrets class. It's something I've wanted to offer since the last time I offered the Towers class. Lots of you were asking for me to unwrap it and blow off the dust...but I think this is a much better alternative! Bootcamp has all the jewelry-making fun that the Towers class had...plus some. In fact, it's ALL jewelry making. Whoop! Not only will I show you how to build and solder your own bezel focal pieces, from scratch, but we'll also work with purchased bezels, open back bezels, objects and butterfly wings. Fun stuff! See that nifty little dot on the roof of this piece? We're going to do that, too. Inclusions? Yeah. Riveting? Of course. Other stuff? Yep! Ok...so if you're looking for the scooby on Bezel Bootcamp, click here. Registration is up and running. One more thing; thank you for the warm reception of this class...you guys are awesome! A lot of you have been asking for my BoHo Bliss class...and I fully intend to offer it again, online, at a later date. Hoop-La is an in-person class, and while it IS a "hoops" class, it's a totally different class than the BoHo class. Fear not!...there will be a lot of new material for you in the Hoop-La class! So...if you've taken the BoHo class and you're hesitant about Hoop-La...don't be! There's lots of new stuff...new techniques and ways of putting things together, in Hoop-La. I promise you...we're going to have tons of fun! Hello, my friends! While I've been busy at work on Bezel Bootcamp, I've been thinking about how quickly August is coming on. As much as I love teaching online classes, I also crave being around other artsy souls, and seeing YOU...in person! If you've ever been to one of Linda Young's events, you'll know that she cultivates an atmosphere of relaxed creativity and kinship amongst her attendees. We've been lucky to have been offered this chance for creative communion and learning for just over 10 years at Art Unraveled. It's a fabulous venue. Linda knows what she's doing. Thank you, Linda, for doing a superb job of organizing this well run art retreat! I'm blessed to have the opportunity to teach at AU, again, this year. This, I think, will be one of the last times I teach my Bloom Bangles class, in person. I can't even tell you how much fun it is to make these things! My students have loved this class. Oh, hoops...how I love thee! My last class offering is a new class called Hoop-La. It's a spin off of my very popular BoHo Bliss class. 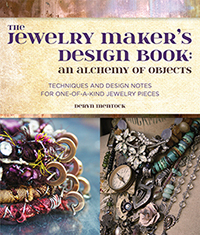 I tried to cram as many techniques as possible, into this class...stuff you can use, not just for earrings but, for all kinds of jewelry making adventures. If you've not been...and you're wondering what all the hub-bub is about, come, and join me in class!